What costs are incurred by external asset management? It is not possible for a universal answer to be provided in relation to this question. The extent of the relevant fees depends on a wide range of factors, and is based mainly on the portfolio structure and the agreed extent of services. In order to provide better orientation, the enclosed table sets out the individual components with their values based on an arm’s-length consideration. Costs may differ depending on complexity and period. and is higher than a minimum IRR hurdle (between 7 % and 14 % IRR depending on the fund and the customer), and may result in significant figures in the event of success. 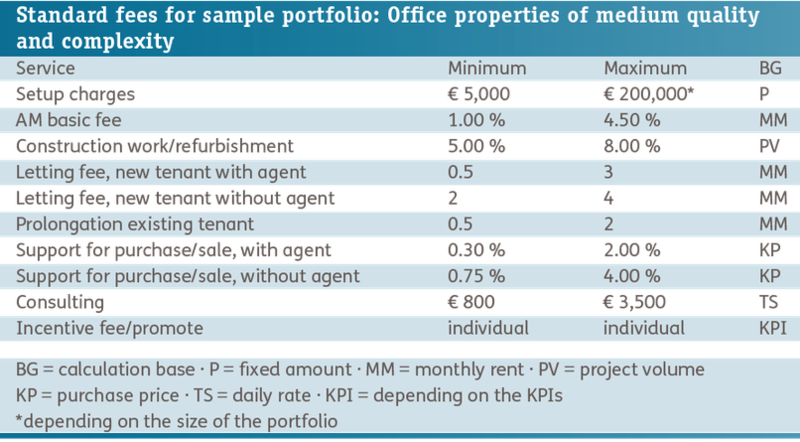 The co-investment of an AM service provider is usually between 2.0 % and 10 % of equity. Without co-investments, profit-linked remuneration is either not possible or is much lower.